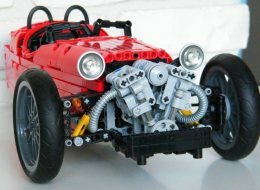 Guess you may like this great three wheeler LEGO Technic Morgan, by Nico71. Independent suspension to the three wheels and the characteristic uncovered front motor. Just compare this, with the real thing. You should be able to find more soon, at www.nico71.fr. Really like the car and the song. The comment seems to not work, I re-try. Many thanks conchas for the featuring ! The review is available with HD picture and instructions soon.